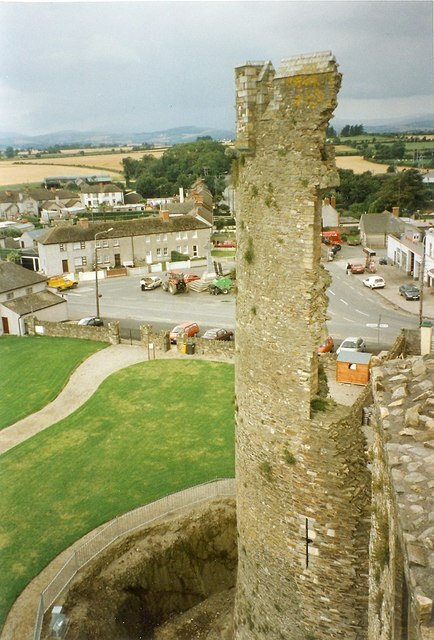 Notes: Ferns Castle, an Anglo-Norman fortress, was built in the 13th century by William, Earl Marshall. Today about half of the castle still stands. The town also contains the 13th-century St Edan's Cathedral (Church of Ireland) this Cathedral is not the original one but the ruins of the original one can be found a few feet away from the existing one and the existing Cathedral today is not the fully restored Cathedral it was supposed to be (it was order by Queen Elizabeth I to be rebuilt to its former self by the O'Byrnes of Wicklow but they only restored part), which is the Cathedral today. It can be seen as an artefact and a museum and of course a church. The Tower and the Chapter House were added on in the 19th century. It also boasts several high crosses and parts of crosses. The old Catholic church stood at the north of the town until the 1970s, when there was a roof problem. The Parish Priest at the time ordered it, with the go ahead of the parish to demolish it. A convent, St. Aidan�s Monastery of Adoration now stands in its place. The foundation stone of the new Church of St. Aidan was laid on the Feast of St. Aidan, 31 January 1974, the foundation stone lies at the northwest corner wall of the church at the entrance to the sacristy. The new Catholic Church was completed in 1975. In the 2000s the new church went under a major refurbishment since it too had roof problems with leakage of the roof and so on, there was a previously roof problem 15 years after the church was built. They replaced the slates with new composite metal-material, the inside was also refurbished and few minor changes were made to the look of the building. A plaque listing the names of parish priests, from 1644, is on the wall to the right of the altar, beside the pipe organ. The pipe organ in St.Aidan's Catholic Church is more than 100 years old and used to be a "pump" organ until the parish modified it to electricity. The pipe organ was transferred from the old church to the new church and is still in use. The Anglican Cathedral and the New Catholic Church are open daily The Anglican Cathedral - all day and The New Catholic Church - 9 am until around 4pm, usually or sometimes later on Fridays. The 19th century population peaked in 1851, but never reached the levels of medieval times. Lewis's Topography of 1834 claimed the town "consists chiefly of one irregular street, and contains 106 houses indifferently built, retaining no trace of its ancient importance". The Abbey, St.Peter's Church (Catholic and Anglican), and the remainder of the great cathedral are regarded as holy places and regarded as church still this includes the abbey which now has the title of a church and abbey.